Desktop-devel-list (d-d-l) is an interesting place. You follow discussions that usually tend to fork off, moving through tangential arguments; but, in the end, some stuff keeps turning up. Lately, for instance, every thread seems to end up on discussing about Tracker. Let’s take the discussion about having a GNOME “media center version”; you could think that such a discussion will end up laying out some ideas about a media center. Wrong: we ended up discussing about special folders – an argument that has already been discussed to the death. Obviously, if you read d-d-l all day you can’t really expect having time to actually work on the features (or the crack) proposed on the list. So, for a change, I decided to do stuff after saying what could be done. I decided to take an idea that has been floating around for ages and implement it. It’s completely identical to the FileChooser in trunk, really, but the places on the left are parsed using this. The code, obviously, merges the places saved using the old format. But wait, the keen reader familiar with the issue will interrupt, the whole point of this mess is localising the name the user sees in the interface. Indeed, that’s why the bookmarks have a title and a description; through intltool we can extract those two and put them into the po file for the translators to work on – exactly like we do for the Glade files. 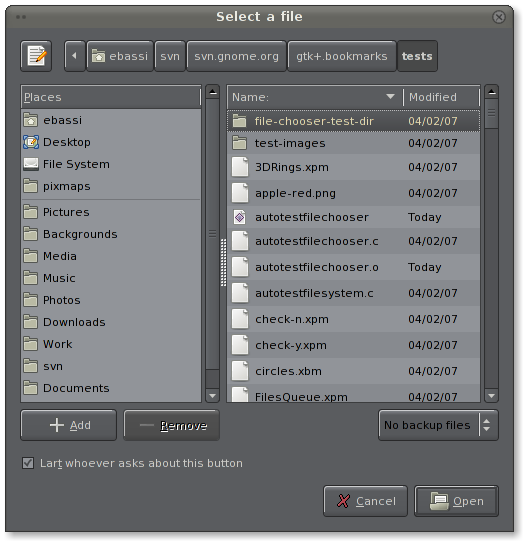 Before displaying the bookmark will pass the string through gettext, which will return the localised alias using the application’s domain – or we could add domain argument to the gtk_file_chooser_add_shortcuts() function above. 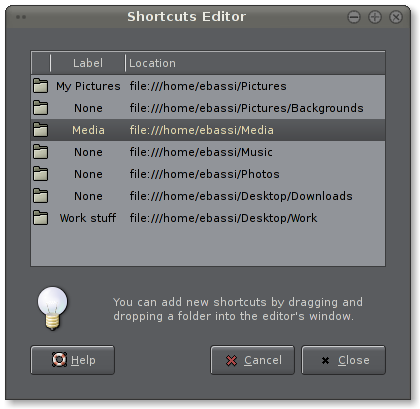 The file chooser can also load shortcuts automatically, using the application name to filter out what’s interesting. Is this the most correct solution for this problem? I don’t really know, even though using bookmarks and applications make more sense than using dot-desktop files and MIME types (come on? MIME types? Like I should bind a directory to specific types of content and not to the applications that are most likely to use them – and what are “MIME types” anyway?). At least, however, this is a start and there’s some code to comment on. The patches are roughly done, but the real treat would be to split the places section of the file chooser widget into its own widget and let other applications, like nautilus, use it directly without having to cut and past tons of code out of GTK+. Decemberists: Yesterday evening, The Decemberists were in London, and made a wonderful concert at Shepherd Bush. I’ve fallen in love with the band after vieweing the video of their song Sixteen Military Wives and I started getting my hands on their whole discography (right now, only the singles are missing). They played mostly songs from their new album, The Crane Wife, which is really as good as it can get (so go out and buy it now). gnome-utils: It seems that my plea for someone to work on GFloppy has been useful; right now, Paul Betts and Riccardo Setti are working on a replacement using HAL and libparted, and are also getting the ball rolling for adding formatting support directly in HAL. Guys, you rock! 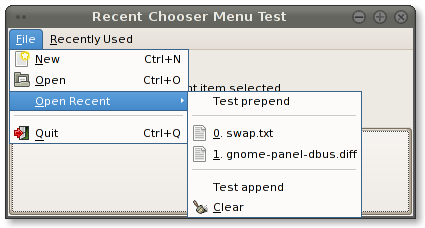 GTK+: I’ve been working on fixing some bugs of the GtkRecentChooserMenu widget; specifically, bug #377164 and bug #405696. While I was at it, I finally closed the FIXME I left in code, for supporting both appending and prepending custom menu items in the recent files menu, and finally added a test case for the widget, so I can track regressions. FOSDEM ’07: Like last year, at the end of February I’ll be in Bruxelles, attending FOSDEM.